At Mowat Landing Cottages, we understand the need for family-friendly fun when you stay with us in Ontario. Our Family Vacation Packages include Cottage Rentals, Boat rentals, and more! We offer bocce ball, crochet, volleyball, and horseshoes. There’s a paddle boat to use, we rent canoe’s & Kayaks by the hour. There are excellent & safe walking/hiking trails around the camp. 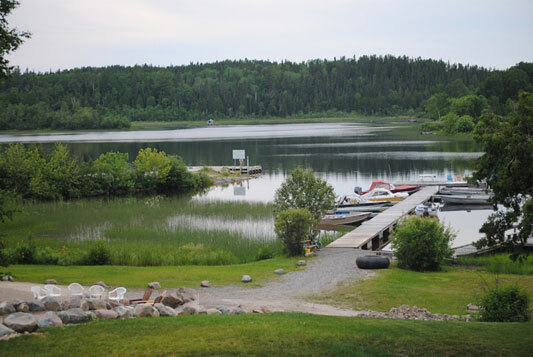 Located in beautiful northern Ontario, we offer sixty-eight kilometers of river fishing on the majestic Montreal River, also four hundred and fifty kilometers of shoreline to fish on the world-renowned Lady Evelyn Smooth water System. With access to over three thousand kilometers of “world class” snowmobile trails, snowmobiling and ice fishing are at your disposal. With hectares of untouched wilderness cross country skiing and snow shoeing is magnificent. Access to several remote outback lakes filled with pickerel (walleye), small mouth bass, pike, perch, whitefish, speckled trout, and lake trout, makes for peaceful days on the water. We don’t offer you five shiny stars to show our prestige or staff to bring tissue each time you sneeze. We don’t offer you TV in bed, swimming pool or spa. But you do feel at home here wherever you are. We’ll offer you moonlight viewed from our dock. A vacation where you’ll never have to look at a clock. whenever you’re tired, you just close your eyes. and fish when you want to throw in a line. just come as you are, there’s so much to be gained. and memories to draw on in the toughest of times. The atmosphere’s heavenly, the freedom’s unique. Come stay with us, for a day, month or week. We have WIFI and bell express-view receivers and TV’s in each cottage. With one exception, the “Love Shack” for apparent reasons.